Michael Williams | Northern California Land For Sale!! Matte laminated double gatefold cover. With a conversation between Steven Baldi and Matt Sheridan Smith. 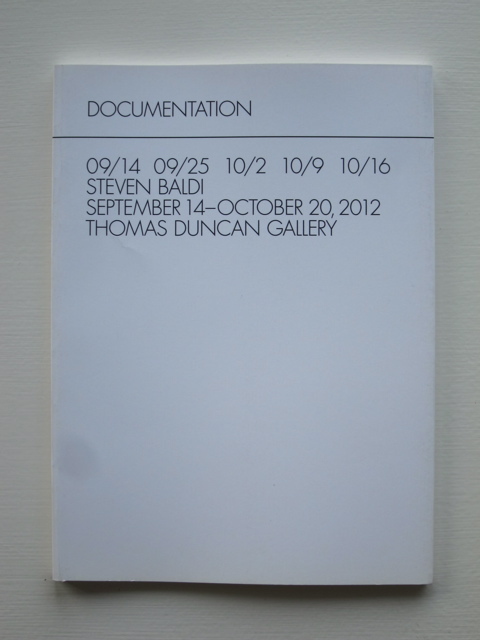 Documentation is a catalog of Steven Baldi’s recent exhibition at Thomas Duncan Gallery in September of 2012. The publication is an in-depth look at the role photography has on exhibition perception. Featuring photographs of the works in the exhibition, as well as installation images of the changing sculptural configurations, and a conversation between the artist and Matt Sheridan Smith.